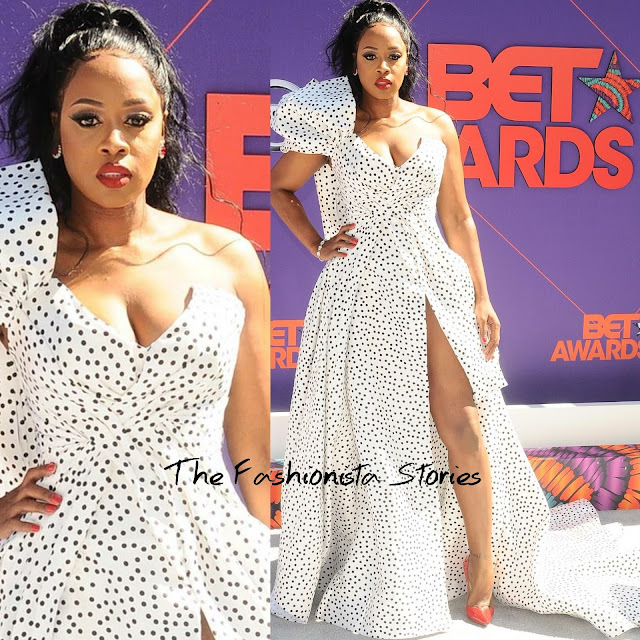 Remy Ma was on hand for the 2018 BET Awards this evening(June 24th) at the Microsoft Theater in LA. Turning to what seems to be her favorite red carpet designer, she wore a custom KAREN SABAG one-shoulder white & black polka dot gown with a ruched bodice, a waist high split and a train detail on the side. Instead of wearing a tie-around or ankle strap sandal, she opted for simple red pumps. I actually like this look and I think this is one of her best. She finished up with a complimentary beauty look. What do you think of Remy's look?